The Food and Drug Administration said only women who read and sign a brochure about the risks of the device will be able to receive the implant made by Bayer. The checklist of risks must also be signed by the woman's doctor. 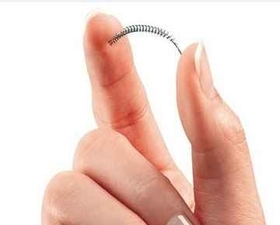 The new requirement comes almost two years after the FDA added its strongest warning to Essure, citing problems reported with the nickel-titanium implant. The agency also ordered Bayer to conduct a study of the device's safety. "Despite previous efforts to alert women to the potential complications of Essure, we know that some patients still aren't receiving this important information," said FDA Commissioner Scott Gottlieb, in a statement. "That is simply unacceptable." An agency spokeswoman said via email that the new requirements "ensure that the device continues to meet our standards for a reasonable assurance of safety and effectiveness." In a statement after the announcement, Bayer said it will continue to tell health care providers about "the importance of appropriately counseling each patient on the benefits and risks of Essure." Public health advocates questioned the FDA's new requirement, suggesting patients may not read the lengthy brochure. "How many people do you know who would carefully read a 22-page document before signing it?" said Diana Zuckerman, president of the National Center for Health Research, a consumer advocacy group. "In addition to being much too long and technical, the information provided will be confusing to many consumers." Bayer received FDA approval to sell Essure in 2002 and promoted the product to women as the only non-surgical option for permanent birth control. Essure consists of two nickel-titanium coils inserted into the fallopian tubes, where they spur the growth of scar tissue that blocks sperm from fertilizing a woman's eggs. Because of the reported complaints, Bayer was ordered to conduct a 2,000-patient study in 2016. Although the company is making "adequate progress," the FDA said Monday that it will require additional study sites to enroll more patients in the study. The agency notes that sales of Essure have fallen 70 percent since the previous FDA restrictions were announced. Bayer faces lawsuits from approximately 16,000 U.S. women who have received Essure, according to the German conglomerate's latest annual report. While the company is insured against product liability lawsuits, the Bayer notes that the claims "exceed the available insurance coverage." The company stopped selling Essure outside the U.S. last year.